^ Sobolev, Vyacheslav. JEDEC: Memory standards on the way. digitimes.com. 2005-05-31 [2011-04-28]. （原始内容存档于2013-12-03）. “DDR3以后的存储器技术都已经着手研究中。JEDEC一直按照标准化进程划分存储器世代层级：现有世代、下一世代以及其未来，三个世代”原文：Initial investigations have already started on memory technology beyond DDR3. JEDEC always has about three generations of memory in various stages of the standardization process: current generation, next generation, and future. ^ DDR3: Frequently asked questions (PDF). Kingston Technology. [2011-04-28]. （原始内容 (PDF)存档于2011-07-28）. "DDR3 memory launched in June 2007"
^ Valich, Theo. DDR3 launch set for May 9th. The Inquirer. 2007-05-02 [2011-04-28]. ^ Hammerschmidt, Christoph. Non-volatile memory is the secret star at JEDEC meeting. eetimes.com. 2007-08-29 [2011-04-28]. ^ 8.0 8.1 Graham-Smith, Darien. IDF: DDR3 won't catch up with DDR2 during 2009. PC Pro. 2008-08-19 [2011-04-28]. ^ 10.0 10.1 Novakovic, Nebojsa. Qimonda: ddr3 moving forward. The Inquirer. 2008-08-19 [2011-04-28]. ^ Gervasi, Bill. Time to rethink DDR4 (PDF). July 2010. Discobolus Designs. [2011-04-29]. ^ Nilsson, Lars-Göran. DDR4 not expected until 2015. semiaccurate.com. 2010-08-16 [2011-04-29]. ^ By 'annihilator'. DDR4 memory in Works, Will reach 4.266GHz. wccftech.com. 2010-08-18 [2011-04-29]. ^ 15.0 15.1 15.2 15.3 15.4 15.5 Marc. Hynix produces its first DDR4 modules. behardware.com. 2011-04-05 [2012-04-14]. （原始内容存档于2012-04-15）. ^ Gruener, Wolfgang. Samsung hints to DDR4 with first validated 40 nm DRAM. tgdaily.com. February 4, 2009 [2009-06-16]. （原始内容存档于2009年5月24日）. ^ Jansen, Ng. DDR3 Will be Cheaper, Faster in 2009. dailytech.com. January 20, 2009 [2009-06-17]. （原始内容存档于2009年6月22日）. ^ 21.0 21.1 Samsung Develops Industry's First DDR4 DRAM, Using 30nm Class Technology. Samsung. 2011-04-11 [26 April 2011]. ^ 22.0 22.1 Perry, Ryan. Samsung Develops the First 30nm DDR4 DRAM. techgage.com. 2011-01-06 [2011-04-29]. ^ Samsung Develops Industry's First DDR4 DRAM, Using 30nm Class Technology. Samsung. 2011-01-04 [2011-03-13]. ^ Samsung Samples Industry’s First DDR4 Memory Modules for Servers. 互联网档案馆的存档，存档日期2013-11-04. ^ SK Hynix Developed the World’s First Highest Density 128GB DDR4 Module 互联网档案馆的存档，存档日期2014-04-12. ^ 30.0 30.1 30.2 Shah, Agam. Adoption of DDR4 memory faces delays. IDG News. 2013-04-12 [22 April 2013]. ^ 被记忆体害的！PC 跟涨，出货摔 10 年低. TechNews 科技新报 （中文（台湾）‎）. ^ 三大记忆体齐涨 业界首见. 中时电子报 （中文（台湾）‎）. ^ Samsung mass-produces DDR4. [2013-08-31]. ^ AMD Carrizo APU Leaked, Has DDR4, but Is Crippled in PCI Express Support. ^ Intel flaunts 8-core Extreme Edition Haswell with support for DDR4 memory. ^ Rodger, Andrew; Lunny, Joan. Crucial DDR4 Server Memory Now Available. The Wall Street Journal (The Wall Street Journal). 2014-06-02 [2014-06-04]. Crucial, a leading global brand of memory and storage upgrades, is now shipping DDR4 server memory. ^ Vättö, Kristian. Computex 2014: Crucial shows Ballistix Elite DDR4. AnandTech (AnandTech). 2014-06-04 [2014-06-04]. Availability is slated for August but pricing has yet to be announced. ^ How Intel Plans to Transition Between DDR3 and DDR4 for the Mainstream. TechPowerUp. [28 April 2015]. ^ Burke, Steve. AMD AM4 Chipset Specs: B350, A320, XBA300 & A12-9800 APU, X4 950. Gamer Nexus. 5 September 2016 [6 September 2016]. ^ 为发烧而生 金士顿DDR3 2400 8G内存评测. ^ Why migrate to DDR4?. EE Times. ^ 50.0 50.1 JEDEC Announces Broad Spectrum of 3D-IC Standards Development. JEDEC. 2011-03-17 [26 April 2011]. ^ Main Memory: DDR3 & DDR4 SDRAM. jedec.org. [2012-04-14]. ^ Tan, Gutmann and Reif. Wafer Level 3-D ICs Process Technology. Springer. 2008: 278 (sections 12.3.4–12.3.5). ^ DDR3 SDRAM Standard JESD79-3F, sec. Table 69 – Timing Parameters by Speed Bin. JEDEC. July 2012 [2015-07-18]. ^ Vengeance LP Memory — 8GB 1600MHz CL9 DDR3 (CML8GX3M1A1600C9). Corsair. [17 July 2015]. ^ RAMing speed: Does boosting DDR4 to 3200MHz improve overall performance?. 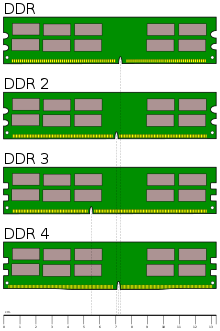 ^ DDR4 – Advantages of Migrating from DDR3, Products, [2014-08-20] . ^ 60.0 60.1 JEDEC Standard JESD79-4: DDR4 SDRAM, JEDEC Solid State Technology Association, September 2012 [2012-10-11]. Username "cypherpunks" and password "cypherpunks" will allow download. ^ 61.0 61.1 61.2 Want the latest scoop on DDR4 DRAM? Here are some technical answers from the Micron team of interest to IC, system, and pcb designers. Denali Memory Report, a memory market reporting site. 2012-07-26 [22 April 2013]. （原始内容存档于2013-12-02）. ^ 62.0 62.1 tandee. 记忆体10年技术演进史，系统颗粒DDR与显示颗粒GDDR差在哪？ - 第 4 页. T客邦.